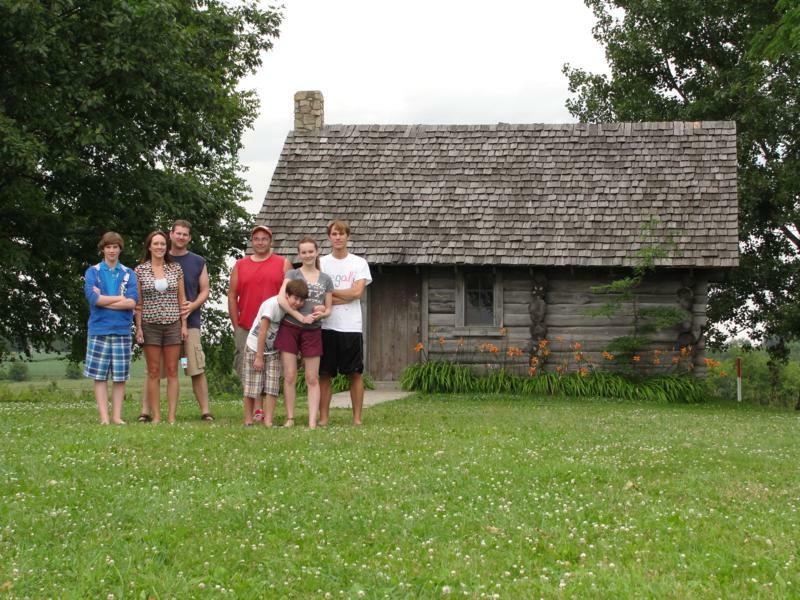 ​Aug 5th - Went to Laura Ingalls Wilder's home in Mansfield,MO where she spent her adult life and wrote all her books. Then on to the Gateway Arch (St Louis Arch). The Arch was awesome, much cooler than any of us thought it would be. 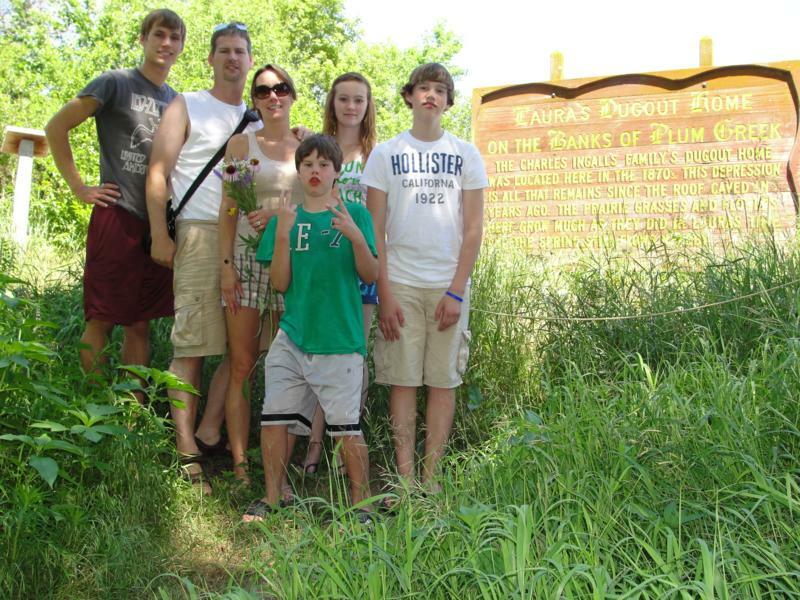 ​Aug 4th - Went to Crater of Diamonds State Park. Didn't get any Diamonds but had fun. Fortunately they had a swimming pool because it was over 100 in the shade! 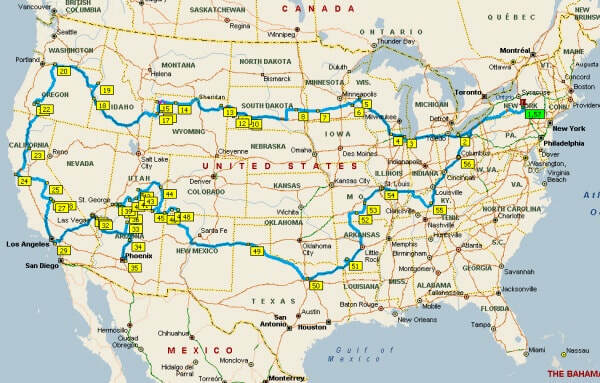 ​Aug 2nd-3rd - Drove through New Mexico, Texas, and all the way to the end of Oaklahoma. ​July 31st - Drove to Monument Valley, the Four Corners, into Mesa Verde and finally to our Hotel in Durango, CO. We were quite dissapointed that the four corners monument was under construction so we couldn't actually stand on all 4 states at once. 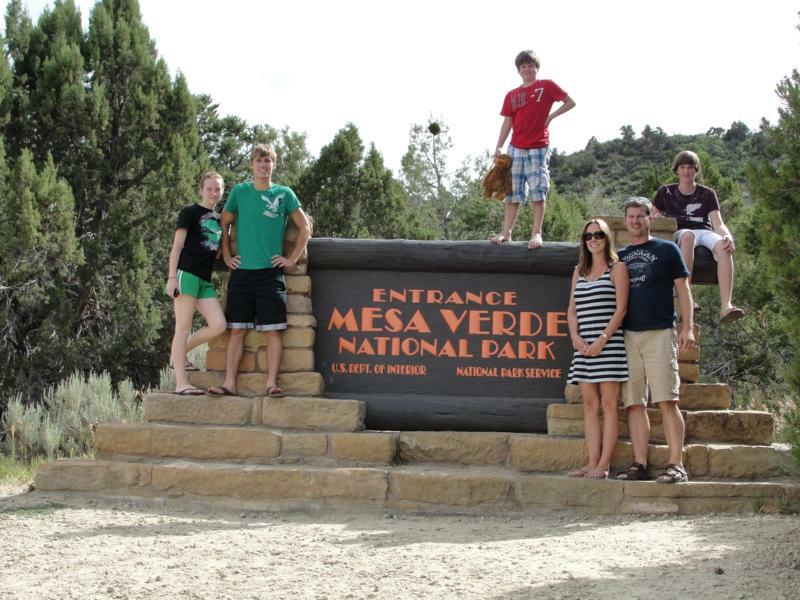 Mesa Verde was awesome! ​July 30th - Went to Arches National Park and took the 3 mile round trip hike to Delicate Arch. BBQ'd in the park for lunch. Had a great time with Phil and the gang from Salt Lake. Thanks for coming down to meet us guys! ​uly 29th - Went to Capitol Reef National Park. Not too much new to see here. Left early and got to our campsite in Moab early which was a nice change from how most days have gone. Around 8:30 Phil, Natalie, Trevan, and Daeja got there to spend the next two nights with us. On a sad note, our 13 year old Yellow Lab Duke had a siezure today and didn't come out of it very well. Our neice and nephew who are taking care of him took him to our vet who said he probably has a brain tumor. He was only somewhat responsive and partially paralyzed and had to be put to sleep. We're all pretty sad about that and we'll surely miss him gretting us at the front door every time we come home. 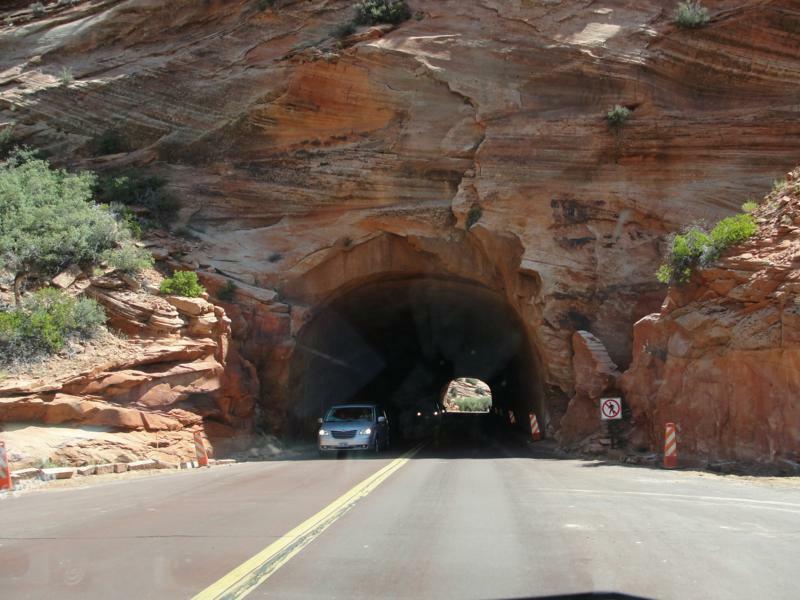 ​July 28th - Drove through Zion and saw some of the Park we couldn't see on the shuttle tours. Went through the 1.1 mile tunnel and other shorter tunnels too. 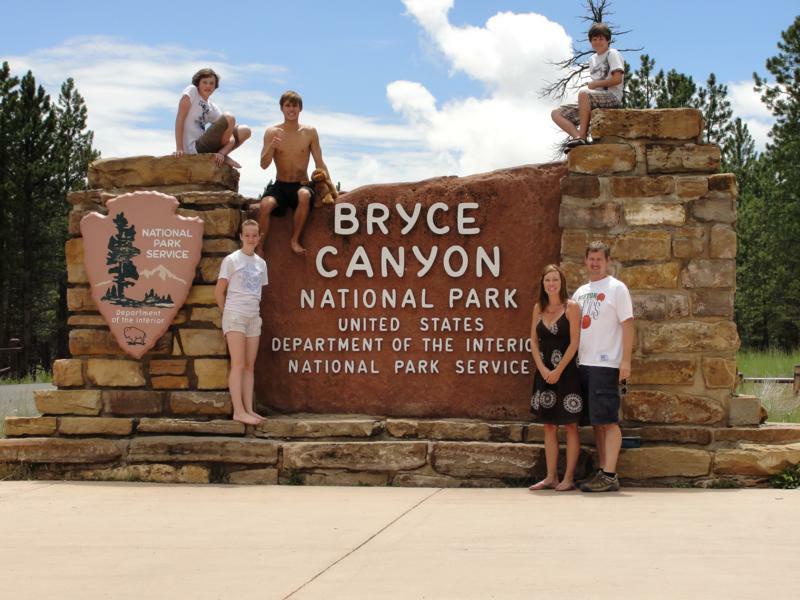 Then drove to Bryce Canyon and checked it out. 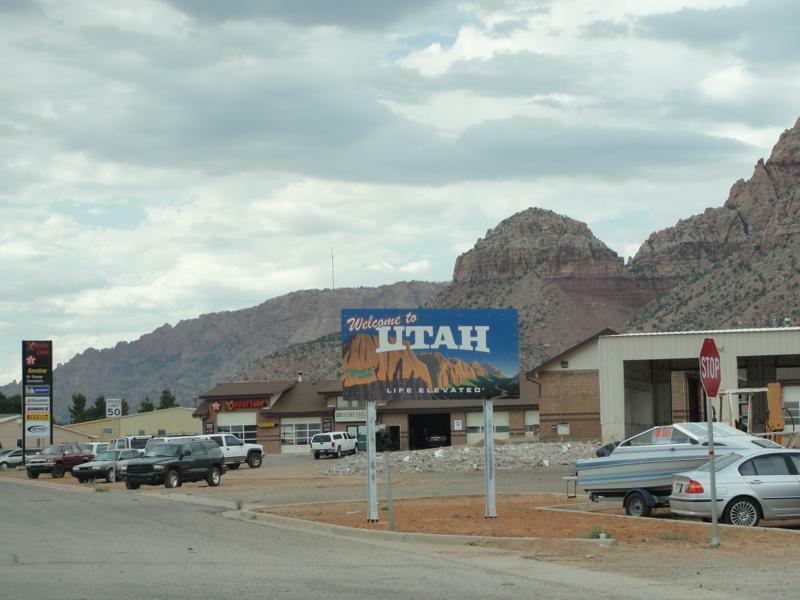 Finally drove on to Torrey, Ut to stay for the night. ​July 27th - Went to Zion National Park for the day. Nothing else unusual to report, which is good. ​July 26th - Drove from Grand Canyon to Hurricane, Utah via the Vermillion Cliffs. Thankfully, no issues with the RV Today! 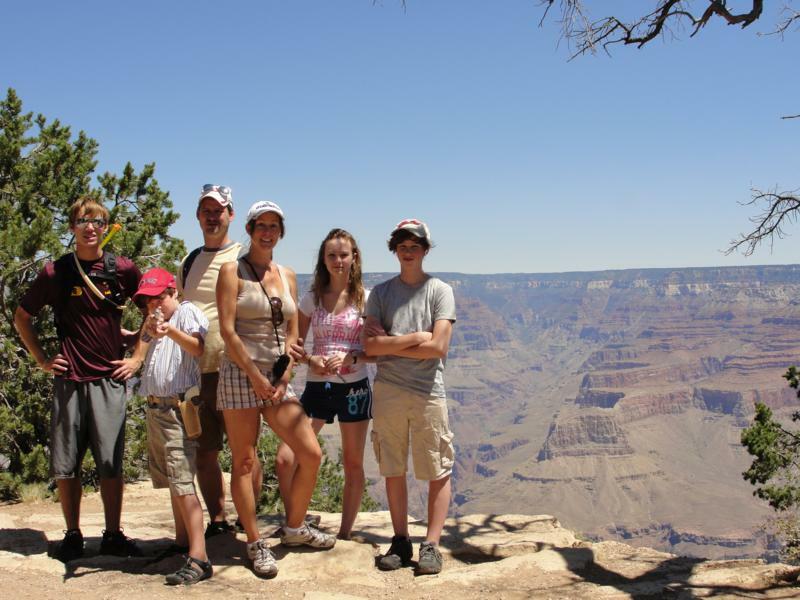 ​July 25th - Spend the whole day at the Grand Canyon. Took a 3 mile hike (1.5 each way) down into the canyon, which as they predicted was very exhausting even though it was only 85 out at the rim of the canyon. ​July 24th - Left Lake Mead and toured the Hoover Dam. Then headed for the Grand Canyon. Just as we were nearing our exit for Williams, Az the RV stalled again. This time I had a fuel pressure tester and put it on and was able to verify that the fuel pressure was definitely the problem. A nice locale guy recommended I take it to a local garage he used to work at because they could look at it in the morning, even though it would be Sunday. I was able to get it to drive there, stopping a few times along the way. I figured I would try to install the pump I bought myself, and if all else failed I could get the shop to work on it. So I changed the pump in a side lot. Again, thank God that the pump I got was the right one and it was pretty easy to install. Back on the road again and arrived at the Grand Canyon campground by around 9:30pm. Not bad, and back on schedule. ​July 23rd - Left Los Angeles headed for Vegas and then Lake Mead to camp for the night. As we were travelling up a hill about 20 miles long in the Mohave Desert we noticed it looked like a vehicle graveyard. About every 1/2 mile there was a car broken down. I guess 20 miles straight at steep grade and 110 degrees will do that. I was glad we weren't having problems, and then just as we crested the hill we stalled out just like in Chico. I looked over and saw a sign "Rest Area 2 Miles". Thank God we were able to coast the whole way to the rest area. After about 1/2 hour wait the RV started back up again so now I'm starting to think the guy at Jeff's was right when he said that probably it wasn't just the fuel filter and the fuel pump may be going bad. So we drove to Vegas, went to Autozone and picked up a fuel pump, floor jack, and fuel pressure tester. Went to the Pawn Shop from the TV Show "Pawn Stars" and then to the Hash House A-Go-Go where we had the Fried Chicken Benedict which was shown on "Man Vs Food". 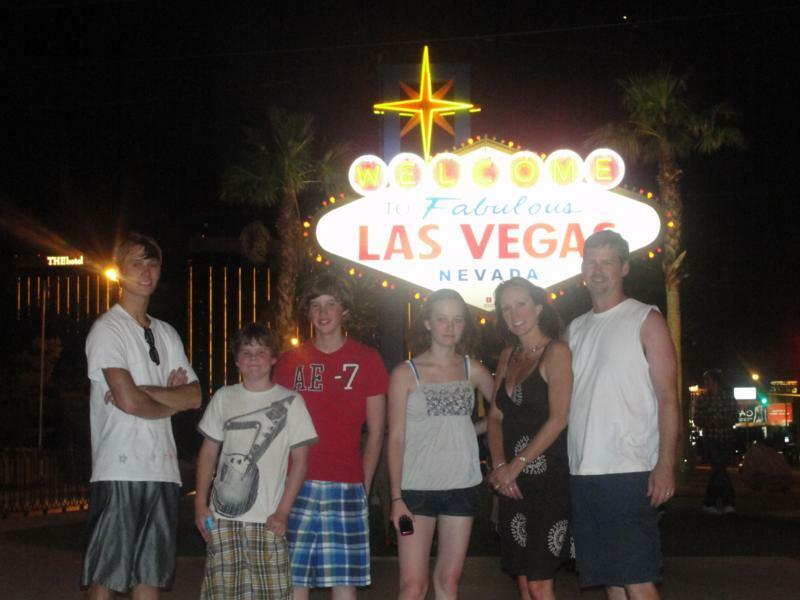 Then back down the strip at night and off to Lake Mead. 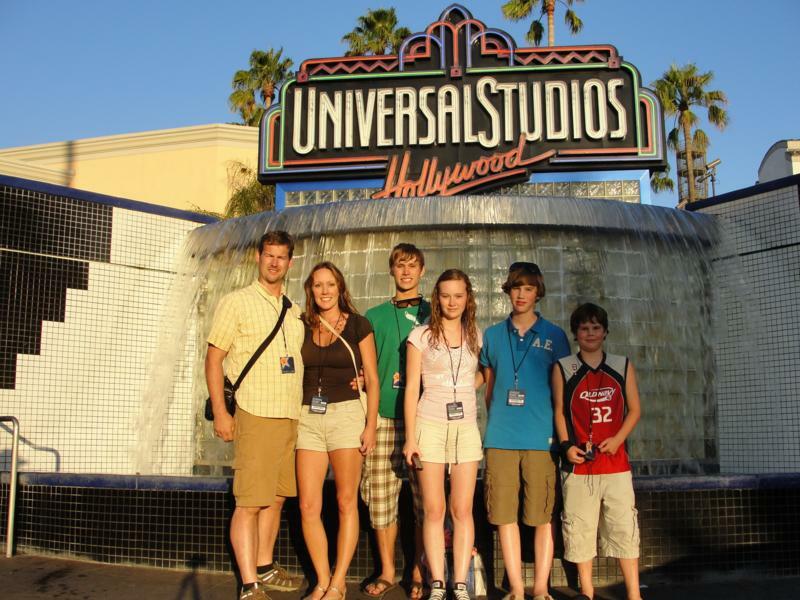 ​July 22nd - Went to Universal Studios and went all out with the "Front Of The Line" Pass, which actually worked. We walked right into rides and shows which had waiting lines over an hour. We all had a great time. Then went to see the Hollywood sign, drive down Hollywood Blvd, Sunset Blvd, Rodeo Drive, and then Santa Monica Blvd to the Santa Monica Pier so we finally reached the Pacific Ocean! ​July 19th-20th - Drove to Sequoia National Park and spent the night there and went to the Giant Grove and also to Moro Rock which has awesome views. I call it cheating since I think only people who hike deserve a view like this but it was fun for everyone. By now the kids said "Enough Big Trees!". ​July 17th-18th - Spent two whole days at Yosemite. Yosemite was awesome. There are a lot of pictures here, but some are missing because we left Jen's camera tonight (we're at the Hotel in Anaheim). I'll get those pictures up soon. The first day we took a full day tour to Glacier Point, the Mariposa Grove of Giant Sequoias, and other viewpoints. The second day Sam and I hiked the 17 mile roundtrip up Half Dome which is 8800ft and 5000ft of altitude change while Jen and the kids took a Horseback ride (those are the pending pictures). ​July 16th - Finally got out of Chico around Noon hoping that the fuel filter was the only problem. Deciced that even though it would mean a late arrival at Yosemite we would still go visit San Francisco to see Rick, Alex, and Bruce Andersen and the Golden Gate Bridge. 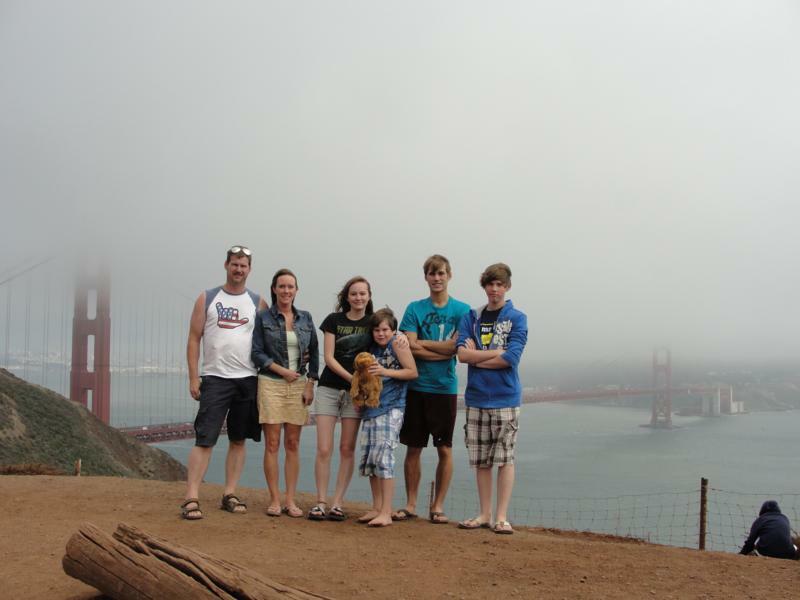 Got to the Golden Gate Bridge viewpoint road we planned to go to and it was closed to RV's. Fortunately we saw the sign too late and went there anyway. Drove up and down downtown San Francisco in the RV until we found Rick and then had a nice Indian meal with the Andersen's and caught up with what's going on since we last saw each other 15 years ago or so. 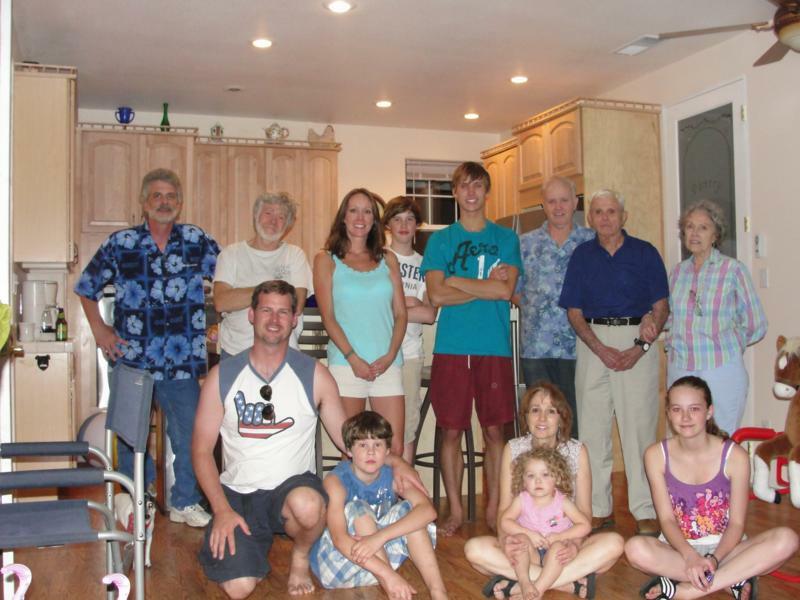 ​July 15th - Drove down to Chico, CA to visit Jen's relatives. Got to Chico fine but when we started the RV back up it wouldn't run right. Had to call Roadside assistance and get towed to Jeff's Truck Service where they hooked us up and let us camp for the night. Had a great BBQ dinner at Dave and Faith's house with Jean, Harlan, Dave, Faith, Dallas, Harley, and the rest of the crew. Thanks for the hospitality! Right now (10am July 16th) Jeff's is changing out the fuel filter which Robb said we should have a spare of way back when we were in Chicago. It was completely plugged up! ​July 14th - Checked out the Columbia River area including Multnomah Falls and then drove up Mt Hood, past Mt Jefferson and the Three Sisters and to Crater Lake. Crater Lake was awesome! ​July 13th - Drove up to Hell's Canyon hoping to go to Hell's Canyon overlook but the road was closed so we headed up the canyon valley to the Dam instead. Then drove to White Salmon, WA for the night. 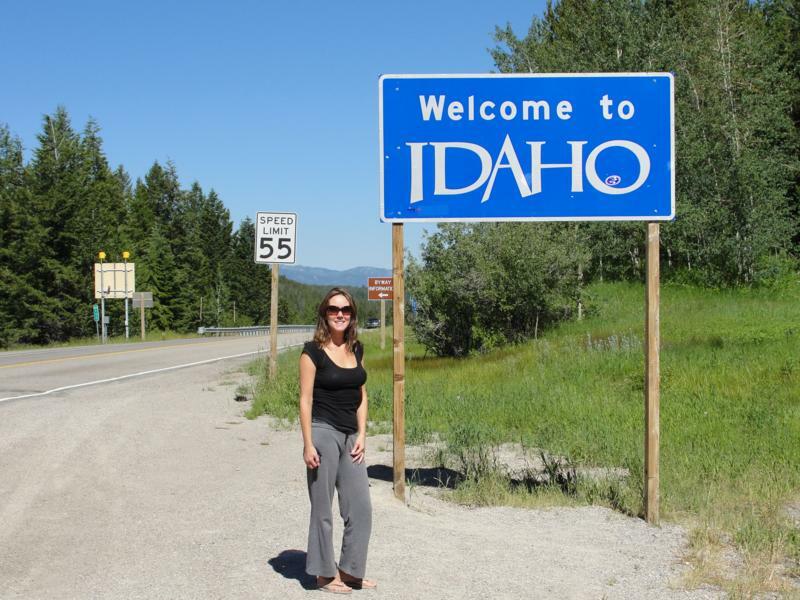 ​July 12th - Drove across Idaho and just over the border into Oregon. 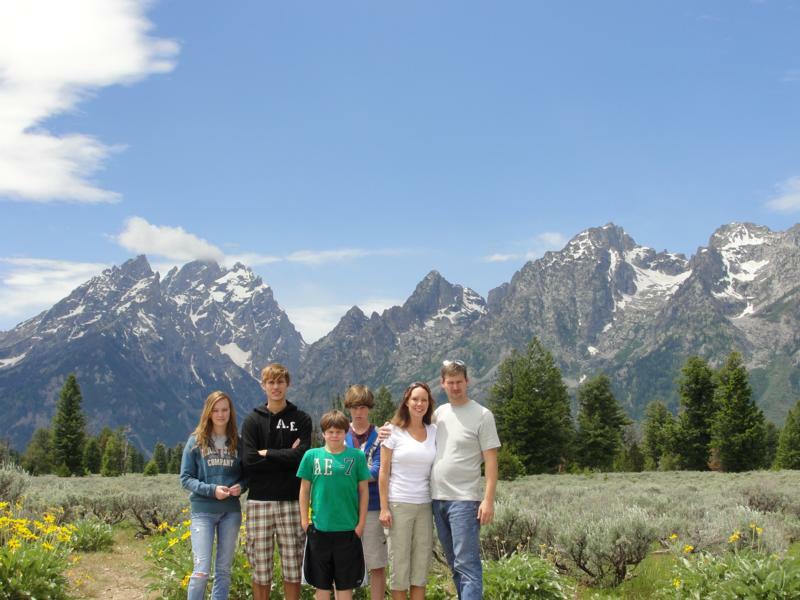 ​July 11th - Spent the day driving around Grand Teton National Park in a rented van. These mountains are truly breathtaking! Bought Jenny a lot of Jenny Lake stuff at the store and had dinner at the Signal Mountain Lodge. ​July 9th - Went to Mt Rushmore and there was a lot more to do than I thought there would be so we spent more time here than planned. Also went to Crazy Horse Memorial. 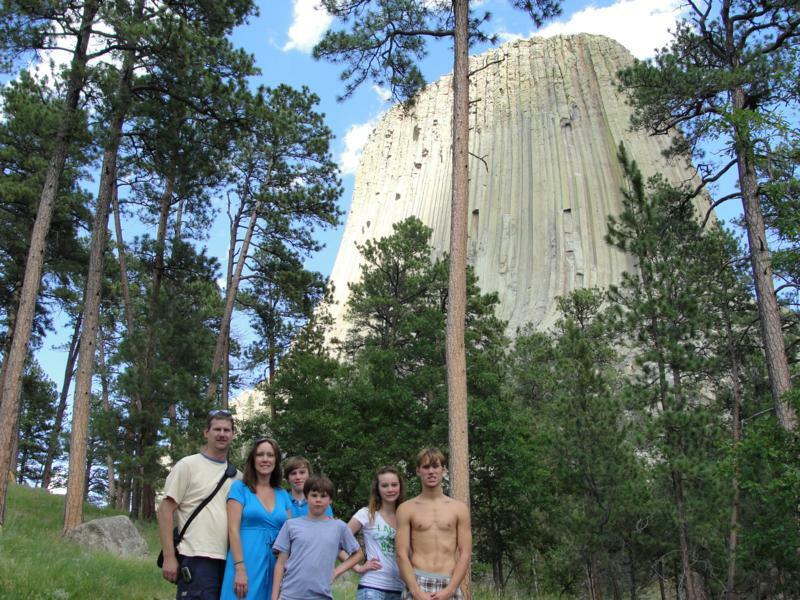 Then off to Devil's Tower and a long drive through Wyoming and over the BigHorn Mountains to Cody, WY. ​July 8th - A lot of driving today. Crossed the Missouri River. 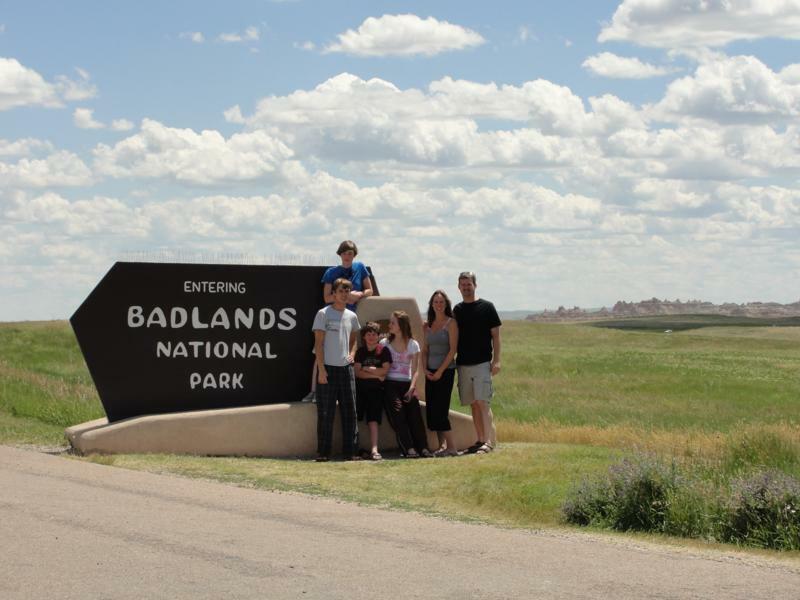 Then toward the end of the day went through the Badlands of South Dakota. Now staying at the KOA in Rapid City, SD. Finally got internet service so I could update the website with July 5th-8th so be sure to check out those days too. ​July 7th - We thought the rain the night before would be the worst we'd have in the trip. Wrong! Last night we were under a Tornado watch, which apparently is not as bad as a warning. We watched the lightning come in for hours before the rain, and then the rain, wind, and lightning tormented the RV for hours and hours durning the night, shaking us all over. I thought we might wake up in Oz, but we stayed put. This was a day off from traveling. 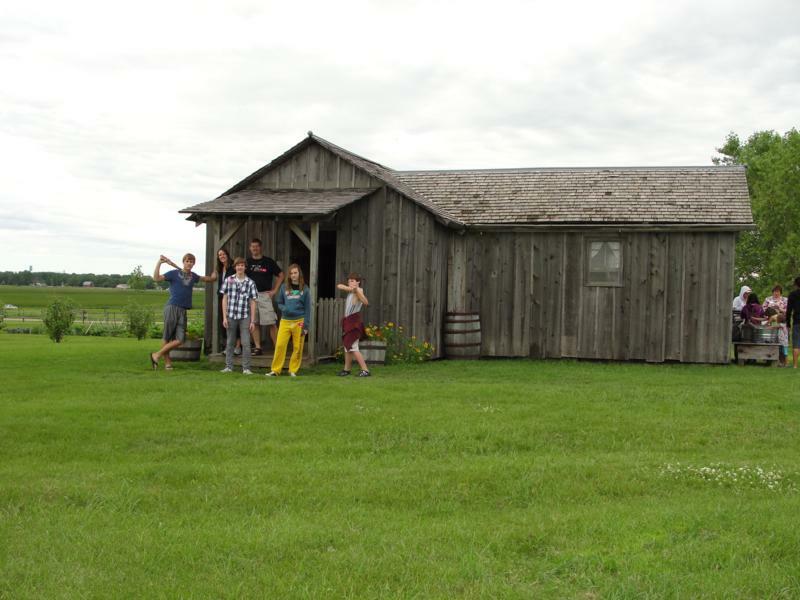 Since we were camping at the Ingalls Homestead we toured the Homestead plus the downtown sites. Pictures include original Cottonwood trees Pa Ingalls planted, a reproduction claim shanty, Surveyer's house, and Pa and Ma Ingalls gravesites. ​July 6th - It rained almost all night long, and very hard. I thought maybe Rob might be soaked out in my tent, but he said he stayed pretty dry. We found out that the skylight in the RV shower leaks. Good place to have a leak if you're going to have one. In the morning. Rob headed back to Chigagoland and we crossed the Mississippi into Minnesota. Stopped in Walnut Grove and checked out Plum Creek and the Laura Ingalls Wilder museum. Continued on to De Smet, SD. ​July 5th - We talked Rob into heading into Wisconsin with us for the night, pretty much because we told him we planned to tour the Leinenkugel Brewery. Also drove out to the middle of nowhere to to see the birthplace of Laura Ingalls Wilder in the "Big Woods" of Pepin Wisconsin. ​July 4th - Got to Chicago...no problems with traffic. Even managed to get to Lincoln Park without any issues. However, there was absolutely no place to park an RV. 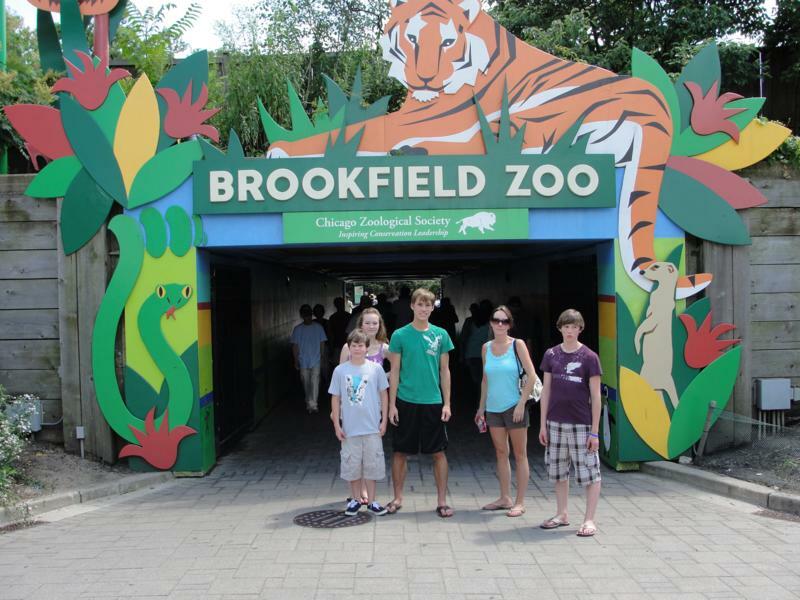 So we went to Brookfield Zoo instead. After the Zoo continue on to Rob's house. Updated the web site from Rob's. Thanks Rob! ​July 3rd - Decided based on the probable crowds to skip Cedar Point and just go to Kalahari Water Park. Good choice.....there weren't a lot of people and we had a fantastic time. 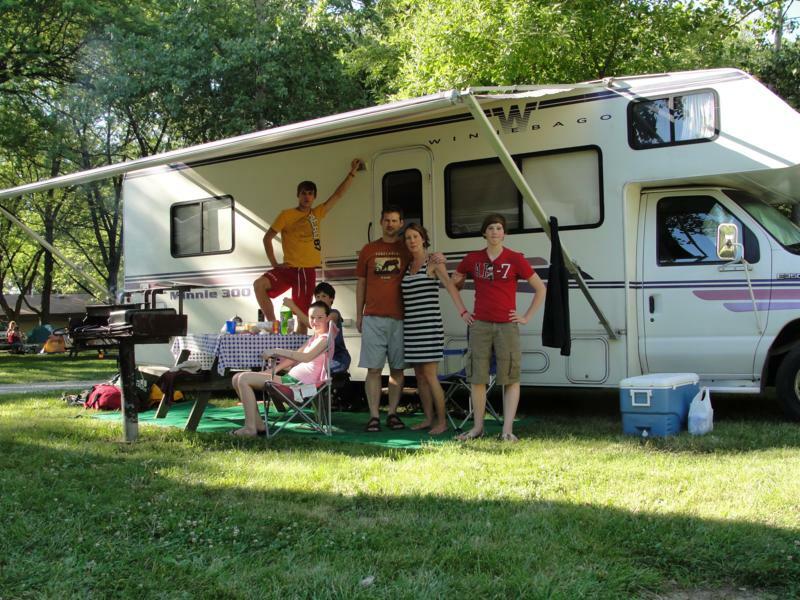 The kids are all at ages where we can really enjoy them each 1 on 1 and let them go in pairs without constant worry.... Not a great place to take a camera so no shots at the water park but there are some of us leaving home and at our campground, Camp Sandusky. July 4 - To Chicago. Lincoln Park Zoo. Stay at Robb's. July 5 - To Pepin, WI. July 6 - to DeSmet, SD. July 7 - DeSmet, SD. 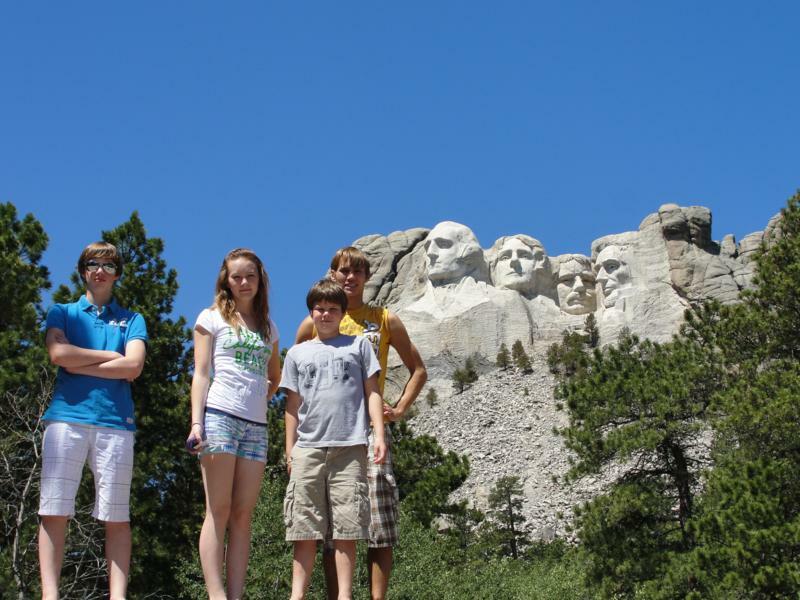 July 8 - To Badlands, SD then Mt Rushmore. July 9 - To Cody, WY for the night. Stop at Devil's Tower on the way. 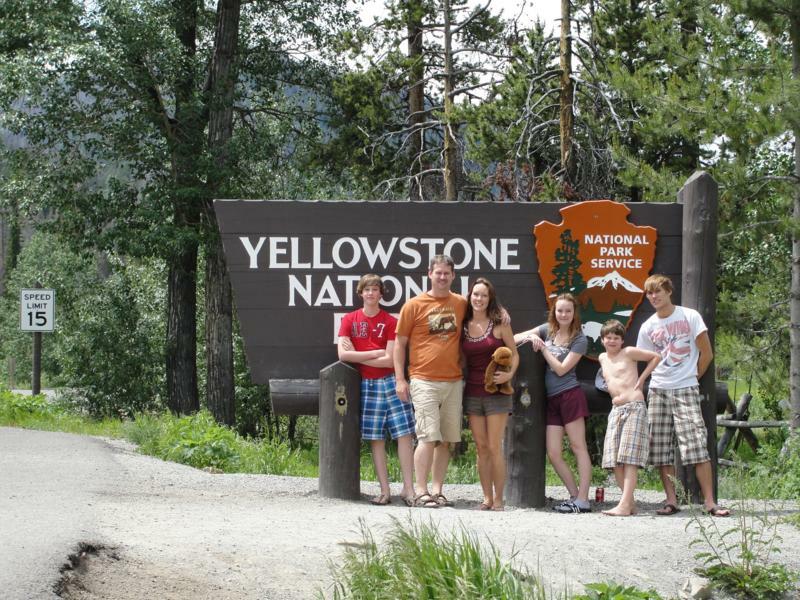 July 10 - To Yellowstone National Park for the afternoon. July 11 - Grand Teton National Park. July 12 - To Ontario, ID for the night. 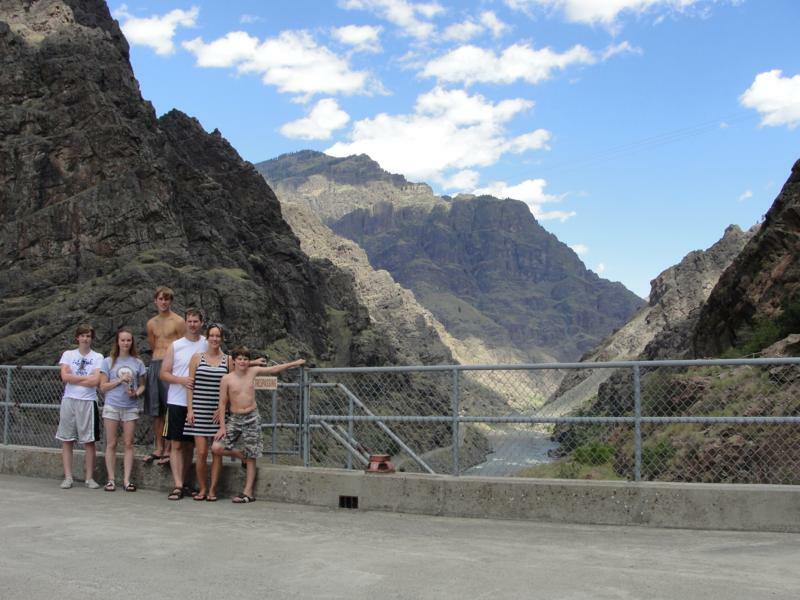 July 13 - Hells Canyon. To Columbia River - White Salmon, WA. 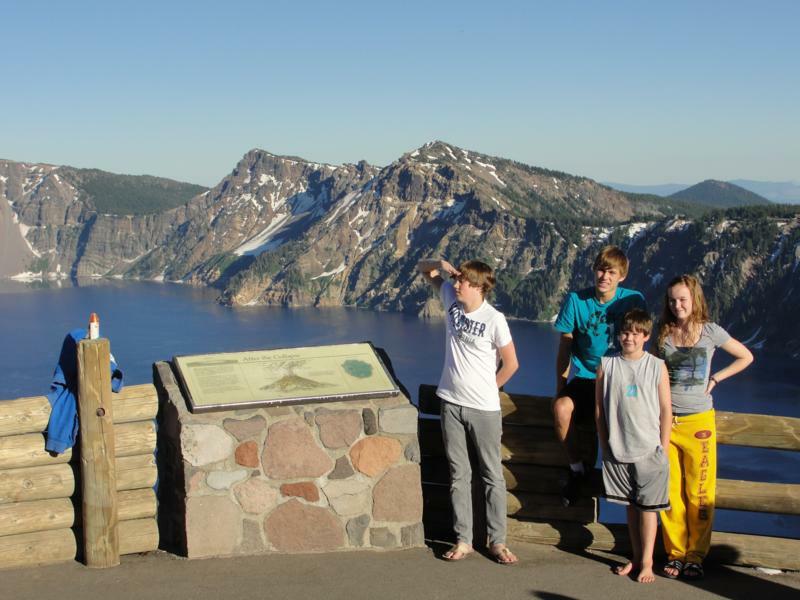 July 14 - To Crater Lake National Park, OR. July 15 - To Chico, CA. Aunt Jean and Uncle Harlan. July 16 - To Yosemite National Park via San Francisco Golden Gate Bridge. 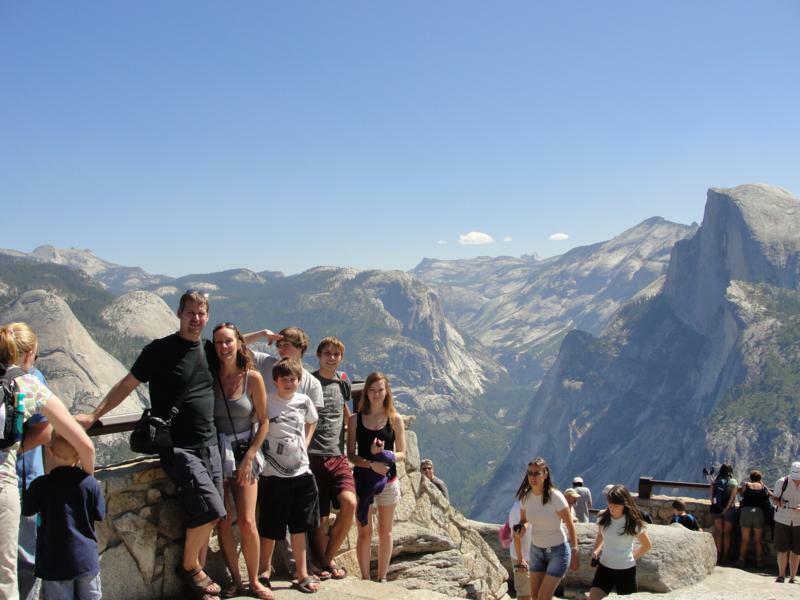 July 17 - At Yosemite. 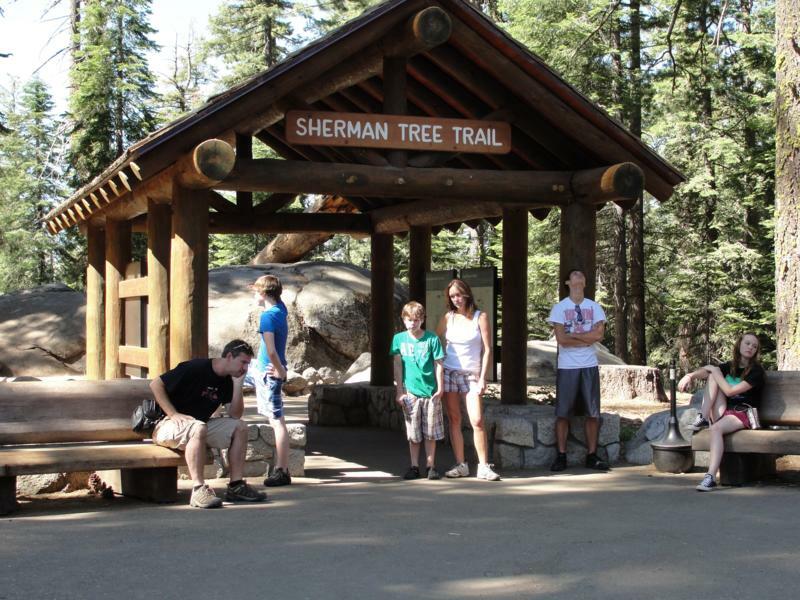 July 18 - At Yosemite. 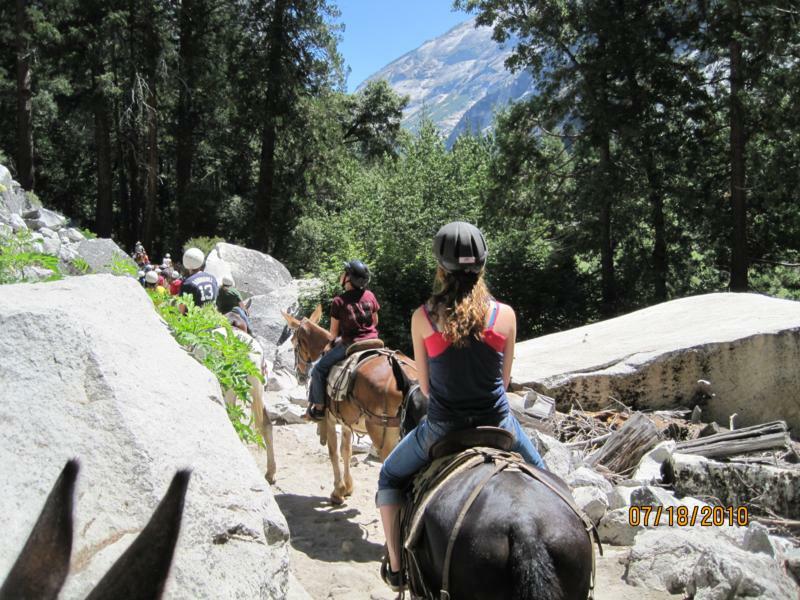 July 19 - To Sequoia National Park. July 20 - To Hollywood and Los Angeles. Dan and Audrey. 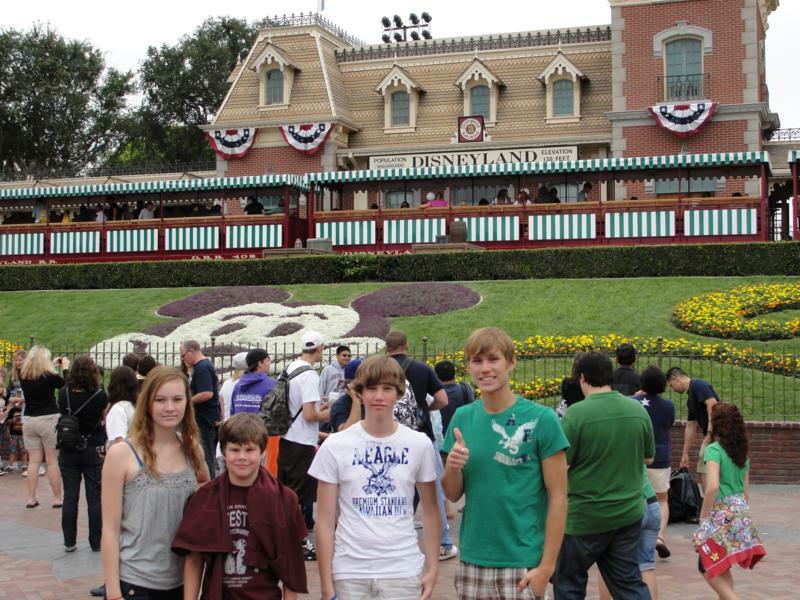 July 21 - Disneyland / Universal Studios. July 22 - Disneyland / Universal Studios. July 23 - To Vegas and on to Lake Mead. 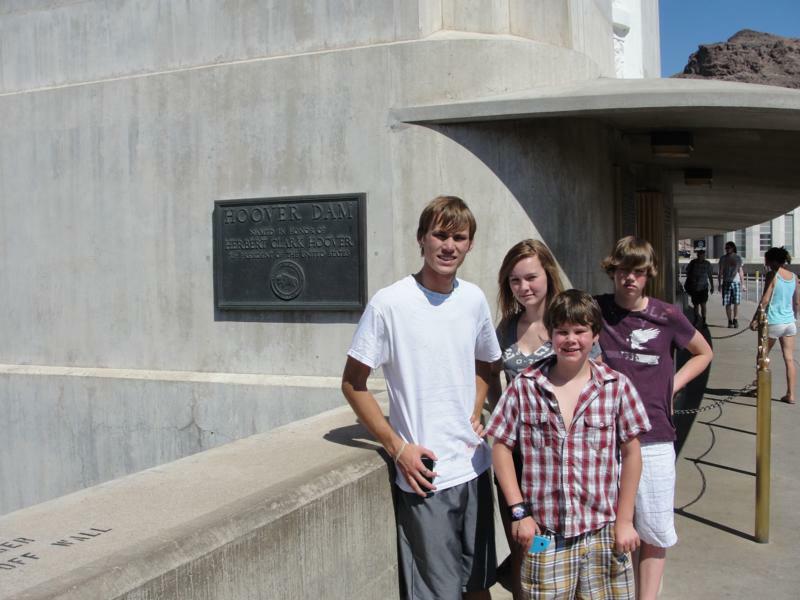 July 24 - Tour Hoover Dam. To Grand Canyon. July 25 - Grand Canyon. July 26 - To Hurricane, UT. Outside of Zion National Park. 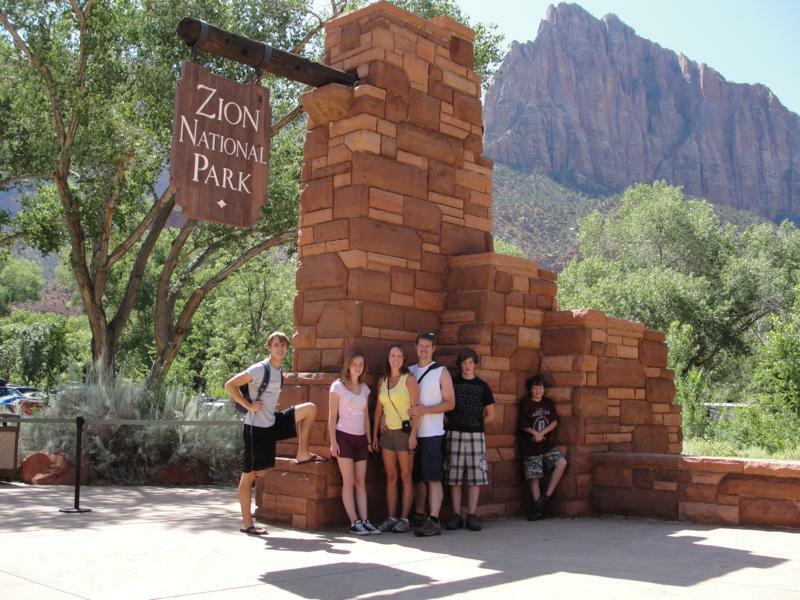 July 27 - Zion National Park. July 28 - To Capitol Reef National Park through Bryce Canyon National Park. 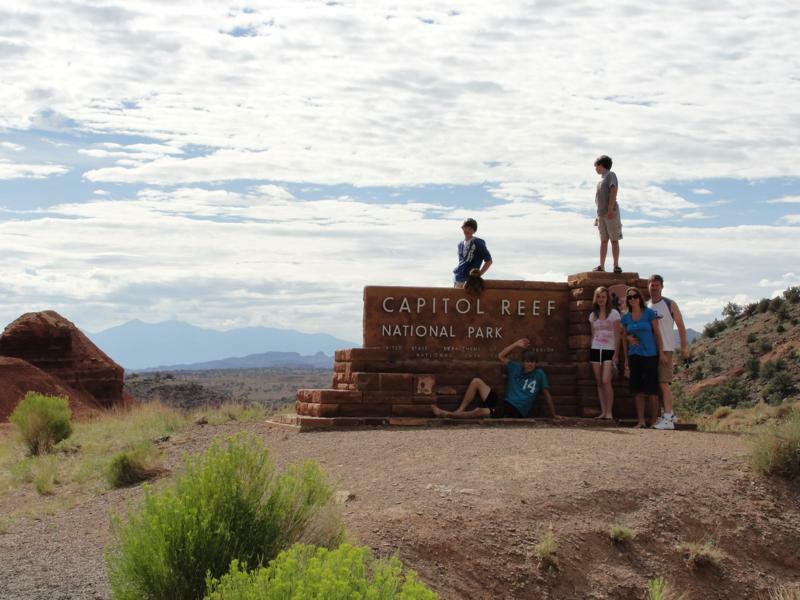 July 29 - Captiol Reef then to Arches National Park. 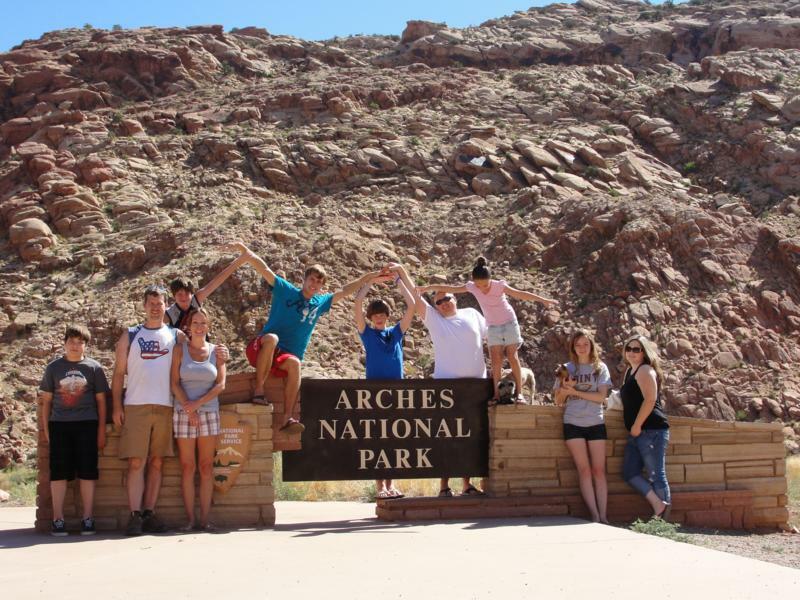 July 30 - Canyonlands and Arches National Parks. 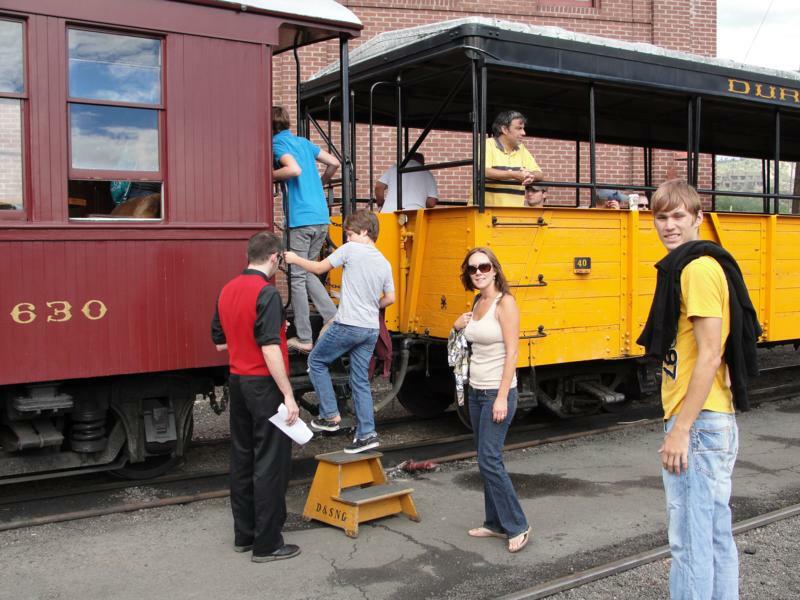 July 31 - To Mesa Verde National Park and on to Durango, CO.
Aug 1 - Durango to Silverton Train Ride. Aug 2 - To Amarillo, TX for the night. Aug 3 - To Dallas. Cowboys Stadium. 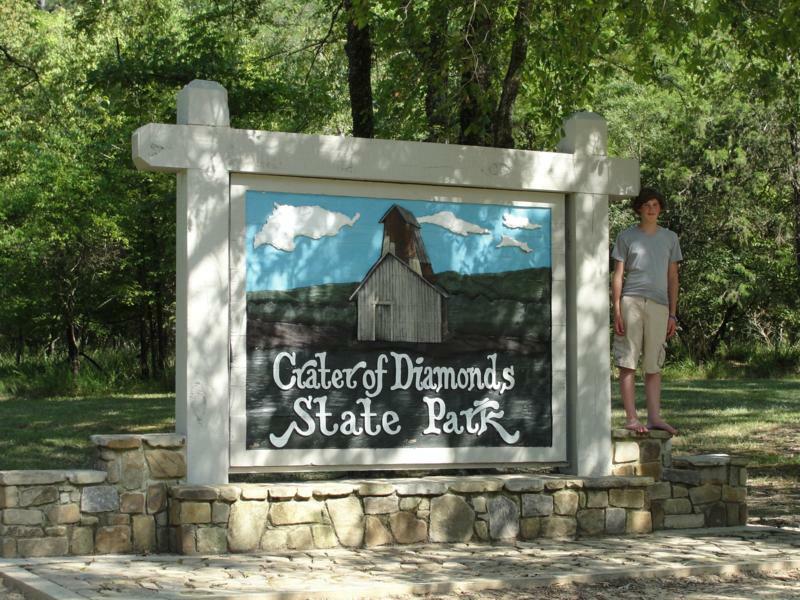 Aug 4 - To Crater of Diamonds, AR. Aug 5 - To Mansfield, MO. 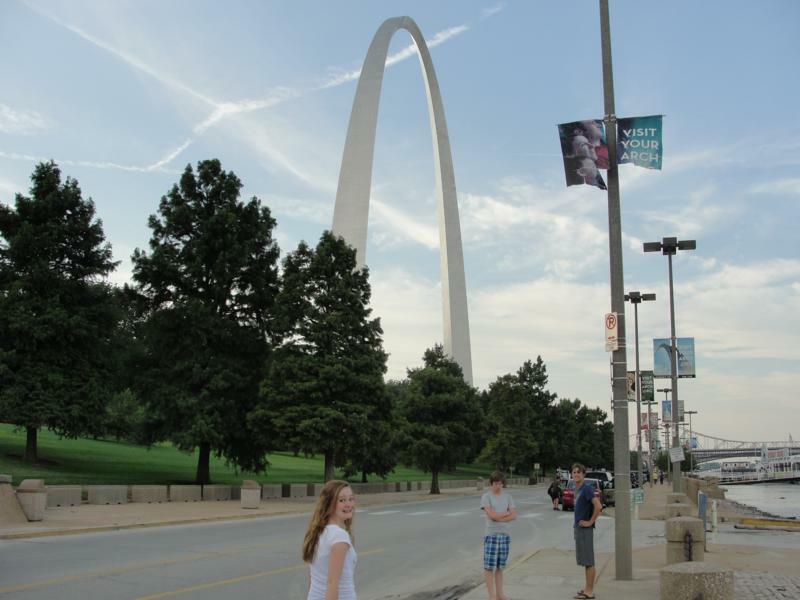 Aug 6 - To Mammoth Cave, KY via St Louis and St Louis Arch. Aug 7 - Mammoth Cave, KY and on toward home. Aug 8 - Back Home!